Allied Aire, Inc., established in 2003, is a full service heating, ventilation and air conditioning company that provides unsurpassed quality through a higher level of professional service with economically sound prices. Allied Aire, Inc. provides a comprehensive full line of services for residential and light commercial applications. We service all brands of equipment and proudly install the Carrier brand of home comfort products. Systems we service include gas furnaces, heat pumps, air conditioners, gas package units, ductless mini splits, evaporator coils, zone systems, hybrid systems, and accessory components such as humidifiers, electronic air cleaners, UV lights, and purifiers. At Allied Aire, Inc. the “E” in Aire represents our commitment to excellence in the industry. This means exceeding customer expectations is our standard procedure. Your exceptional service experience begins when your call is answered by a factory trained customer service representative and is continued by our professional and skilled technicians who are factory trained to diagnose and provide thorough service to your product. 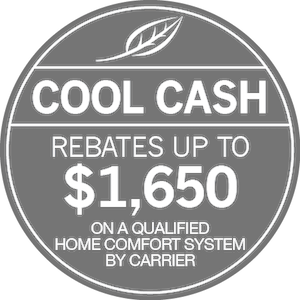 Our technicians will answer all your questions and provide valuable information to assist your decisions regarding all your heating, ventilation and air conditioning needs because we know your time and money is very valuable. In 1902 William Carrier invented what some argue is one of the best inventions in our time: Air Conditioning. In the last 110 years Carrier Enterprise has worked hard to continuously improve their invention and led the industry in high efficiency products. Allied Aire, Inc. has also raised the bar by continuously improving our services and researching new products to provide unique, customized solutions for every home comfort need. Since Founder and President, Jeff Shue, began working in the heating, ventilation and air conditioning industry in 1990 he has continued to stay ahead of industry changes regarding new technology, environmental concerns and business economic designs. Allied Aire, Inc. realizes these changes affect all our lives, and it is our commitment to ensure that all our customers are completely satisfied in all their air quality and home comfort needs. Allied Aire, Inc. is your one stop source for all your heating, ventilation, and air conditioning solutions. The Air Conditioning Contractor’s Association of America is the heating and cooling industry’s leading trade organization. ACCA members adhere to a standard of ethical best practices that is your assurance of quality and professionalism. Allied Aire Inc is an active member in good standing with ACCA. More than 2 million households nationwide check Angie’s List reviews to find the best local service providers. We collect ratings and reviews on more than 720 different services. The people who join Angie’s List are just like you — real folks looking for a way to find trustworthy companies that perform high-quality work. Angie’s List members submit more than 60,000 reviews every month about the companies they hire. They include incredible details about how the project went (including cost), and grade the company’s response time, price, professionalism and quality of work – good or bad – on an A to F scale. Angie’s List members will tell you if a crew was conscious of children and pets, cleaned up after themselves or just totally botched the job.